Yesterday my mother and I took my brother on a mini road trip. The main aim was to check out some op shops and see some of the country side. Here is some of the scenery on the road from Gunning to Grabben Gullen. We had lunch in Goulburn at a cycling cafe, where Tour de France fever seemed to be in full swing. At the Smith Family shop I found a sign advertising Mountain Maid, a brand of tinned food which was produced by the farmers' cooperative at Batlow. This cannery has been out of business for ten years or so, forced to close due to the high price of fruit, the drought, the high Aussie dollar and other factors I suppose. Anyway, as a child my relatives refered to me as the Mountain Maid, so I was quite taken with the sign. Mum asked if it was for sale, and it was so I bought it and took it home. I am still looking for somewhere to hang it in the house - it does not exactly match my decor. My old pal Cindy came to visit and to stay overnight. I showed her a pattern I had printed off, from a tutorial suggested to me by my friend Angel. It is for a stretchy knit skirt with a yoga waistband. Since Cindy is the sort of gal who can rock a maxi-skirt, we thought we'd try and make one with some grey fabric I had lying around. Here's Cindy, hard at work sewing her skirt. 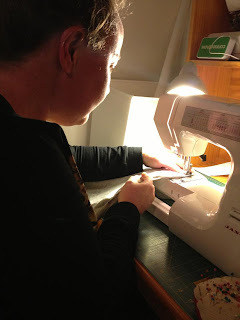 We used the overlocker (serger) for everything but the hem. And here she is trying on her skirt the next day, I think it turned out terrific! Buoyed by our success, we decided to make a dress each with some stretchy fabric I found in an op-shop last year in Bombala. Undeterred by the lateness of the evening, we printed off this tute from the same website as the skirt and poured ourselves another glass of red. This time, instead of printing off the pattern and sticking it together with sticky tape we were instructed to trace a tshirt. We used some old sew-in interfacing that let's face it nobody wants to sew in anymore to make a sturdy pattern. The fabric was navy with white stripes. We folded it in half across its width to determine if there would be enough to make two dresses. I am guessing there must have been about three metres of the stuff. I folded the fabric so the selvage edges met in the middle. Kinda like folding a tent (the Brownies amongst my blog readers will know exactly what I mean). Then we knew we had enough fabric to cut the back of the dress on the fold on the left, and the front of the dress on the fold on the right. If I had a drawing program on my Mac I'd do a photo diagram for you, with circles and arrows and a paragraph on the back of each one - but I don't, so here's how to fold a tent instead. 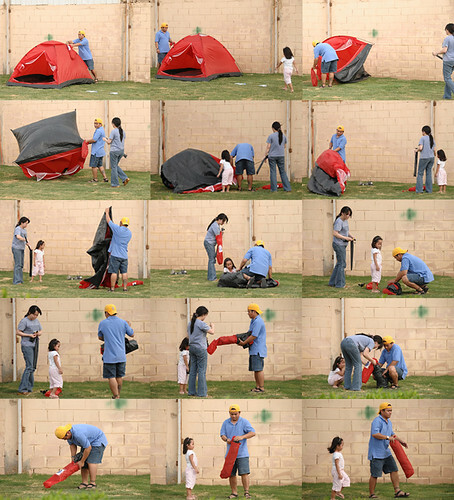 I like folding tents, it is like a little puzzle. Cleaning the dirt and leaves off is not fun though. We had two pieces each, and it was a simple matter to sew the front and back at the shoulders and then down each sides. I took care to painstakingly line up the stripes as I went. The next bit was slightly more complicated. We overlocked the raw edges of the neck and armholes, then used iron on double sided fusible webbing tape to stick down the neckline and make it nice and neat and easy to sew. I think this technique worked really well for the neckline, but we used pins for the armholes as there wasn't much room for ironing on the webbing there. We were both very happy with the results, but since it was almost midnight we had noone to show off to and had to wait until this morning to take photos. DD was our photographer, with BJ the wonderdog supervising the proceedings. I also posed with my new sign. If you have any ideas about how to display it in my house please do let me know. It was so nice to have a sewing buddy, as I generally work in solitude. Cindy was very enthusiastic and took home some bright green pear fabric so I am hoping she has a new tshirt to show me when she comes to visit again. I love that maxi skirt! It looks so comfortable to wear. I just bought a maxi dress this past weekend. The other dresses you made turned out great! My suggestion on how to display your vintage sign in your house: I like the close-up shot of you holding the sign - you are the "mountain maid" - and the sign would look great in your house with you being the easel holding the sign. That means that your new post will be standing stock still in the kitchen holding the sign. All kidding aside - I too have a vintage advertising sign in my kitchen. I have a vintage looking 3 shelf box hanging on a kitchen wall - Vintage collectabls fill the shelves - my house decor is vintag-ey shabby chic. 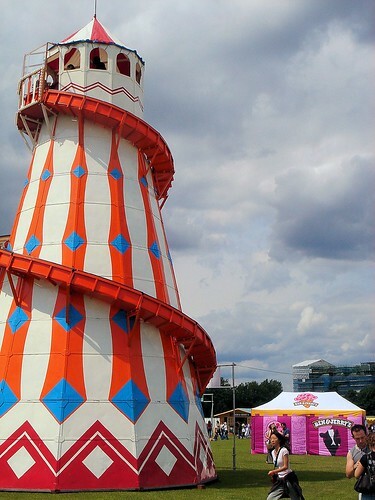 The dresses are great - the Pickle looks cute in her tartan skirt and red striped tee - the tent folding totally flummoxed me. Hmm I could stand very still in my kitchen all day - hubby could bring home takeaway, right? Great job ladies! Kudos also to your great photographer. Looks like you not only had a great time together but have something to remind you of the fun evening. Thanks Jen - and I should have said a big thank you to you for the tutes as well. They were really easy to understand and to follow. Love that grey skirt! Looks so cozy! They look great and you look like you had a lot of fun in the process! Congrats! Love the way the striped dresses came out and I love to see the photos of Australia.